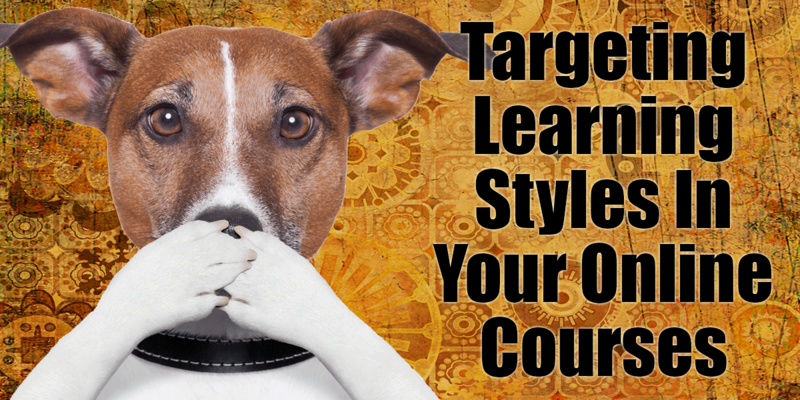 Today’s post is about remembering that everyone doesn’t learn the way that you do and that you need to be mindful of the learning styles you use in your online courses! There are three types of learning styles, Visual, Auditory and Kinesthetic. Generally everyone has a primary means of learning that falls into one of these three. As an online course maker, you should be aware of these and start to think about what that means for creating and selling your courses. Whoa nelly am I in this category! I have to see EVERYTHING and am very visual in everything I do and teach. Visual learners make up between 65-80% of all learners depending on which study you read. That is a huge portion of the population and definitely something you should take into consideration. This type of student will want to “see” everything. They will need to be able to “watch” you do things and will buy using visual cues. If you are targeting visual learners you will need to use lots of pictures in your marketing too to make them stop and take notice of your course. A graphic for one of my marketing mini courses currently has 22 repins and 4 favorites on Pinterest (a very visual social media platform). In a sea of content, you need to make sure that your graphics are glorious to get any attention from your visual peeps. I have a friend and daughter and they are cyphers to me! Just the other day my daughter read a 4th grade story problem to me and when I asked to see it, she said all happy, “no Mom I will read it to you again”. Kir and Desy have to hear everything to understand it. According to the University of Michigan, Auditory learners make up about 30% of the population. That would be a big chunk to alienate if you were just focusing on the visual learners. Auditory learners want to “listen” and “hear” everything. If you are targeting auditory learners in your marketing you will need to use a lot of “listening” cues. Right now is a great time to target listeners because of Podcasts. There has been a recent boom in Podcast shows and listeners and you can reach new customers by hosting or guesting on a podcast (especially if you can get on a big name one like my favorite, Entrepreneur On Fire by John Lee Dumas). Kinesthetic people have to touch and feel everything. They are the ones in retail stores breaking things because they have to pick up everything. According to the University of Michigan, Kinesthetic learners make up about 5% of the population. This is a very small percent of the population, but you can make fairly easy accommodations for them using the content you already have in place! Kinesthetic people want to “feel” and “touch” everything. If you are targeting Kinesthetic learners in your marketing you will need to produce some kind of physical product to accompany your course. Yes, you can offer them a download to print, but if you mail them the corresponding content to their homes or offices they will love you forever. All this is well and good, but does this mean that you should target only visual learners because they make up a huge percent of the population or that you should make Auditory courses because that is what you are? Not exactly. But that said, it is much easier to create content for and relate to someone who thinks and learns like you do. I have to make the graphic for the course before I can know what I am going to talk about, that is how much I am a visual person. You might hate talking on the phone, in which case targeting Auditory people who are going to want to “hear from you” probably wouldn’t be the best path to take. Overall, you should be aware of your primary style of teaching and marketing and then try to incorporate at least a little for the other types of people!